The Los Angeles Dodgers clinched the National League West division on Wednesday night behind another dominating performance by southpaw ace Clayton Kershaw who won his 21st game. On Wednesday, the magical season that Kershaw has enjoyed was on full display as it has been every five days since the season began in April with the exception of the three weeks he missed early in the year. Kershaw was facing the bitter rivals of the Dodgers the San Francisco Giants. He not only delivered when it came to his strength, pitching but hitting and fielding as well. The result was a 9-1 win and the NL West title. Baseball observers are split in opinion as to whether a pitcher can be an MVP since they start just one fifth of their teams’ games. However, on Wednesday the capacity crowd in Los Angeles let it be known with shouts of “MVP, MVP” what their opinion was. Following the game, Kershaw did not even discuss his possibility of winning the MVP, he was instead campaigning that A.J. Ellis his catcher be given a new Dodgers contract for next season. No pitcher in the National League has won the MVP since 1968 when Bob Gibson won the award. The last AL MVP who was a pitcher was Justin Verlander. Kershaw says he does not think about winning the MVP but is honored to be in the same conversation when the award is mentioned. Kershaw hit a triple, but it was his display on the mound that made the crowd rise to their feet more than once. He allowed just one run, while striking out 11 and not walking a batter. He committed a balk, which is very uncharacteristic, but followed that with a great defense play that ended the third inning. Yasiel Puig came through in the sixth with a solo homer for the Dodgers’ go ahead run and Los Angeles cruised from that point. 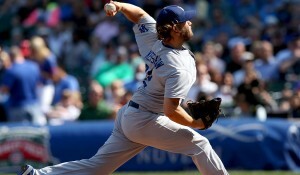 Wednesday was Kershaw’s last start of the season and he ends with a record of 21-3 and an ERA of 1.77. He finished with 239 strikeouts and just 31 walks. The postseason will start next week and Kershaw’s MVP season will continue.